On July 15, 2015, Governor Andrew M. Cuomo unveiled plans for the Western New York Workforce Training Center, a new hub which will focus primarily on training for careers in the advanced manufacturing and energy sectors. The Workforce Training Center will be funded with $29 million from the Buffalo Billion and $15 million from the New York Power Authority. The Center, located at the former Clearing Niagara Headquarters at 683 Northland Avenue, will co-locate two training facilities: an Advanced Manufacturing Training Center and a Utility of the Future & Clean Energy Training Center. 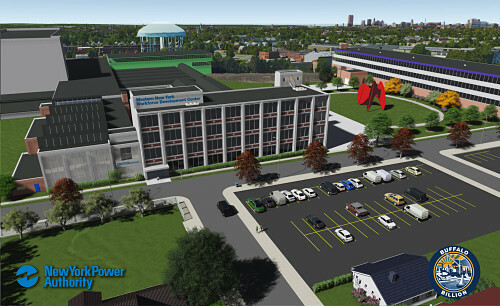 As a signature initiative of the Buffalo Billion and a centerpiece of the New York Power Authority's workforce planning strategic initiative, the Workforce Training Center will help ensure a robust and diversified workforce of highly trained, skilled workers ready to meet the challenges of the 21st-century energy and advanced manufacturing industries. Manufacturing is now the third largest industry sector in the WNY region, employing more than 66,000 people and generating $6.3 billion in gross regional product (GRP). As of 2014, industry estimates indicate that in the next 10 years there will be over 20,000 job vacancies in Buffalo Niagara's manufacturing sector due to retirements and growth. The Center will ensure that the region's workforce has the employment skills to meet these demands. The Workforce Training Center will partner with local manufacturers and energy providers, workforce development training organizations, educational institutions, government entities, and community and faith based organizations to deliver educational services and a comprehensive network of support for residents of Western New York. The Center will have a concentrated focus on providing on-ramps to low income, and other traditionally underrepresented groups. The State recently solicited proposals for operation of the WTC. For-profit, not-for-profit and faith- or community-based organizations were eligible to apply, or could collaborate on a joint proposal. The operator is expected to fully orchestrate and coordinate with the SUNY educational partners that will provide the actual training to structure and schedule programs and curricula for the WTC. The operator is also expected to provide or coordinate wraparound services, placement services, and case managing students in the program. The WTC is expected to train 300 to 400 students yearly in manufacturing and energy jobs. Proposals were due on June 28, 2016 and the State is currently in the process of reviewing and evaluating those proposals.